Information flows continuously in a network of individuals, which are connected with each other as individuals tend to learn from each other through sharing of views or information. For example, an individual’s perception or ratings or reviews of a product might change with time with an effect of the opinions (representing new information) of its acquaintances. Various models have been proposed in the past to study opinion dynamics in complex settings. However, most of these models considered networks as static. In this work, we propose a directed and weighted Temporal Threshold Page Rank Opinion Formation (TTPROF) model, for studying the opinion dynamics using temporal networks. 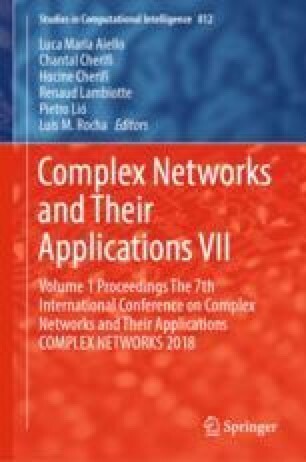 The term dynamics in this work is related to two aspects, firstly, dynamics of the network i.e., the network structure is time varying (temporal) in nature. Secondly, dynamics on the network i.e., opinions of individuals propagating on the network change with time. Opinion of every node is weighted by a factor of its page rank. A node is affected with its neighbour’s weighted opinion. A concept of threshold is added to limit the neighbours from which opinion can be shared. A parameter of the fraction of top page ranked nodes is introduced to consider the opinions of influential nodes irrespective to threshold. We simulated our model using random networks with temporal effect, which shows that as the threshold value or the fraction of top ranked nodes increases, opinions start converging faster and consensus is achieved sooner. But if any of these parameters is decreased, convergence time increases or opinions converge into multiple clusters. This work is supported by H2020 framework project, SoBigData.